Above, a common scene at WYDs: a young couple kissing in an ambience of complete liberty. Below, first row, adolescents of both sexes sleeping close to each other without any barrier to prevent their bad instincts from developing. Second row, a love-in manifestation in a style characteristic of Woodstock. 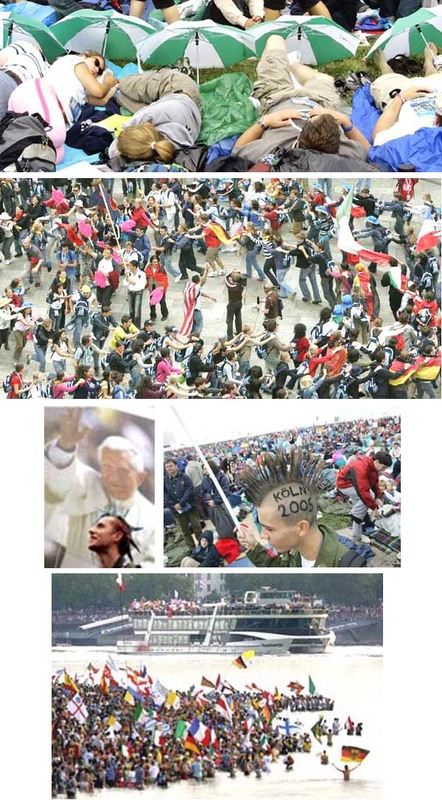 Third row, left, a smiling punk with an extravagant hairstyle looks as if he is being blessed by the billboard's Benedict XVI Right, another punk feels at ease in the tolerant ambience of Cologne 2005 (in German, Köln 2005). Last row, boys without shirts and girls in shorts wade into the waters of the Rhine River to greet the boat of Benedict XVI, arriving for WYD.